The calendar of this Psalter, written in parallel Latin and French versions, was clearly intended for a Benedictine house in the north of England. It includes the dedication of the church of Embleton, a few miles north of Alnwick, in Northumberland. There is also an inscription stating that it was given to St. Mary's Abbey, Whalley, between Clitheroe and Blackburn. 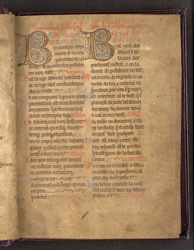 The Latin text of the Psalms is in the left-hand column, and a French translation is in the right-hand column; each has a similar illuminated initial 'B', for the first word, Blessed: 'Beatus' in Latin, 'Beneit' in French.